What is the line in the clone trooper's armor? Not sure exactly what you mean, maybe post up a screenshot? Alot of 3D artists will use a mirror duplication method in-order to create a equal proportioned model, possibly it's the join. Can you still fix Speeder Bikes like you could heal wounded/lame/etc. horses in Native? I've had all the possibly relevant skills in one of my parties and that Swoop Bike is still Damaged... and has been for quite a while. i dont know hnow to save it cause everytime i save and try to come back the game stops working its being dumb i feel dumb for not knowing how to fix this. sorry for bad grammer, to lazy lol. How do you change your ship, like it shows here? You need to have enough credits. 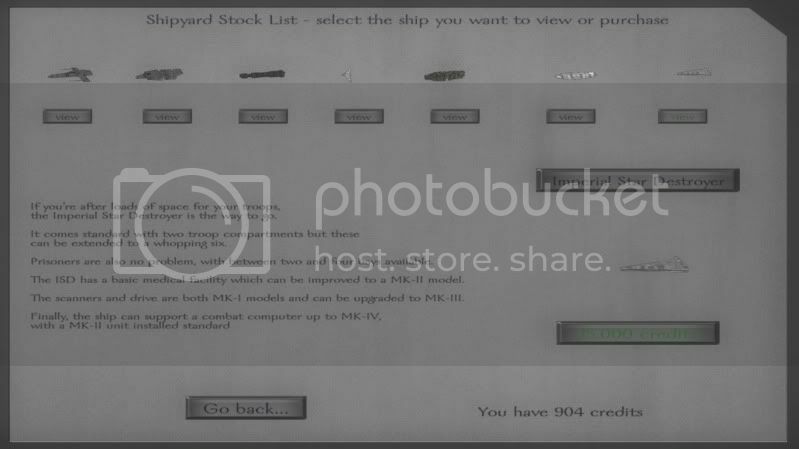 Notice how it says "(X amount) credits" under the picture of the ship? That's the price you have to pay. the problem is with clipping and projectile speeds. sometimes if the enemy is too close and the muzzle of your weapon protrudes out the back of his head or other area, the game won't register it as a hit, since the bullet didn't actually hit the target, but left the muzzle of the weapon while it was on the other side of the target. other times i have noticed that sometimes when the game is a little laggy the projectile will travel so fast that it simply passes through the target before before the game has time to register the hit. in this case, simply zoom in while aiming, and if that doesn't work, move a few feet to right or left and try again. the second case is in my experience, more common in mods that alter the speeds of projectiles, or add guns to the game. it says there are some items from the old republic where can i find them and what are they? I have a question over the spacefights. I can train it in the Academy, but I haven't seen it yet on the "real battlefield", I can only fight on the ship. Isn't it available? When it is available, can I also use my Stardestroyer? Uh, there's a rusted HK-47. I'm not sure if there's anything else from that era. I think they exist as mercenaries and as armour parts from the droid vendors. Aaah, ok, thanks for the answer, because I HATE this A-Wing in the Training academy. The Controls are horrible, maybe it is because I use my left hand and can't handle the arrow keys with the right hand. And I hope that you can do it so, that the SD can't move too much, but have big lasers. And is there a faster and better ship then a fully-upgraded Trade Fed. Ship or a Interdictor SD?